The pipe diameter, air pressure, size and shape of the pipe's mouth combine in mysterious ways to affect a pipe's tone qualities, such as pitch stability, harmonics and how quickly the sound starts after you press a key. The air supply needs to deliver constant pressure regardless of how many pipes are sounding. There's lots of mechanical complexity in the keys. Also, each pipe sounds best at a different air pressure. I’m starting out small: an octave and a half, white-key notes only, from B3 (247 Hz) up to E5 (659 Hz). And I'm keeping it simple: The keyboard is clothespins clamped onto surgical tubing. Mistakes are part of the game. In the photo above, red plastic tape is covering up holes I cut in the wrong place. 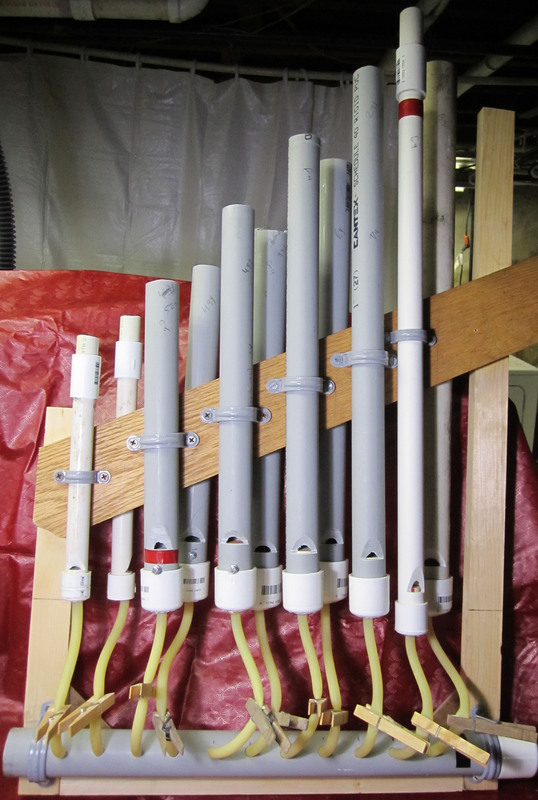 And I cut some of the pipes too short, so I lengthened them with PVC couplings. Neither repair seems to harm the sound quality. Initially, I thought that a small room fan might do the job. I built a shroud to hold the fan and gather the air blast, which I ducted to the pipes. Total failure; the fan didn't have enough pressure to sound even one pipe. Turns out that room fans are optimized to move a lot of air at a comfortable indoor wind speed. This means very low pressure, and you can't raise the pressure by squeezing the wind into a narrow pipe; all that does is reduce the fan's efficiency. My second attempt at an air supply was a foot-operated bellows. Traditionally, a bellows has leather sides, but leather is expensive. Susan suggested I use a $12 vinyl tablecloth (the kind with felt padding on one side) from Bed Bath & Beyond. The bellows was a success of sorts. 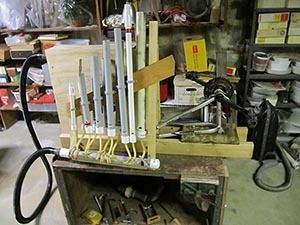 It worked better than I expected, in that it blew enough air to sound all the pipes at once, let alone the one or two that might be played with the clothespin keys. 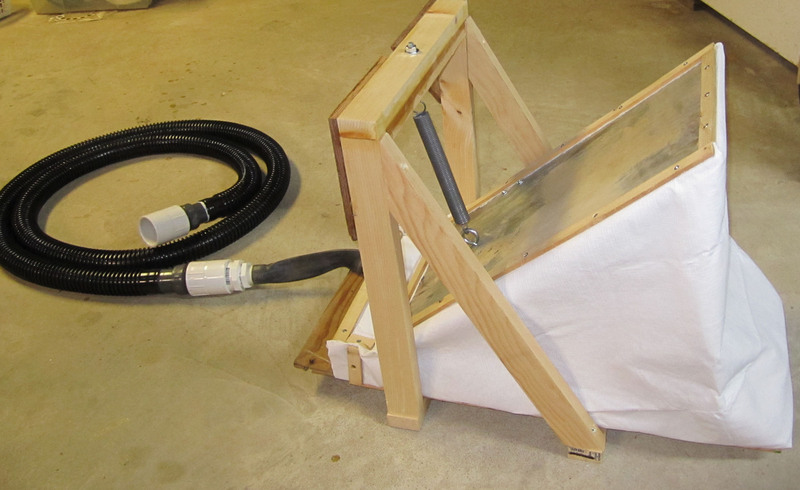 But a bellows can only pump air on the downstroke. On the upstroke, the pipes go silent. One solution might be to build some sort of compressed air reservoir to maintain steady pressure between downstrokes. Another might be to build a second bellows, one for each foot, and pump them alternately. But first, I’m going to try a different approach. 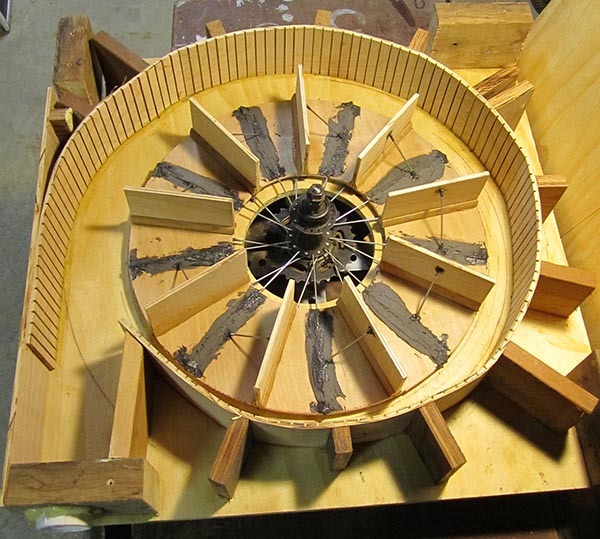 My latest brainstorm is a centrifugal fan, also known as a squirrel-cage blower. To get the fan blades whirling fast enough, I’ll use the rear axle, gears and pedals of an old bicycle. 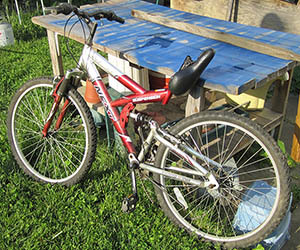 When I dropped into Swarthmore’s friendly local bike shop, Cycle Fit, to see if they could think of any improvements on this idea, they just gave me a bike. 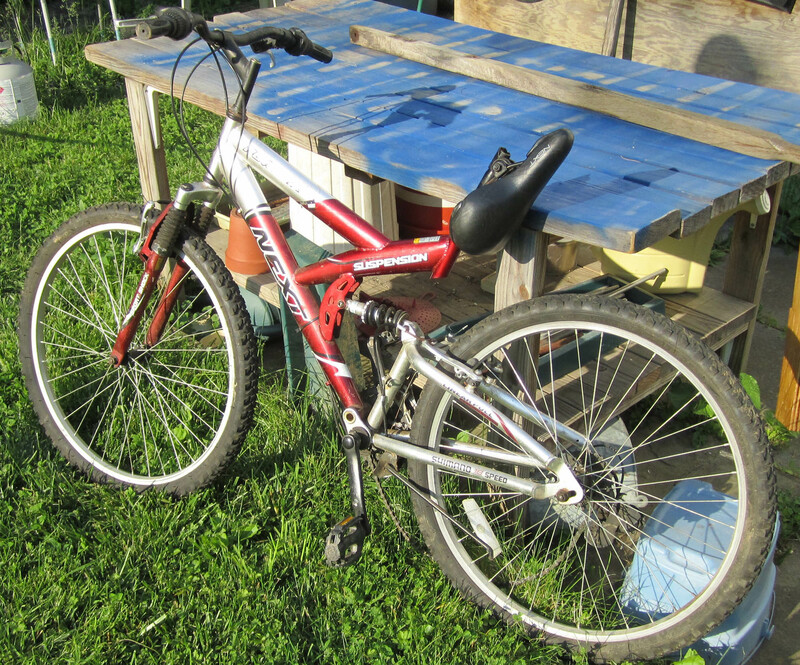 It’s a junker that was waiting for the scrap-metal dealer, and the shop owner decided that my project was even better than recycling; he called it "upcycling" — turning scrap into something useful. All he asked in return was that I tell him how it all turns out. 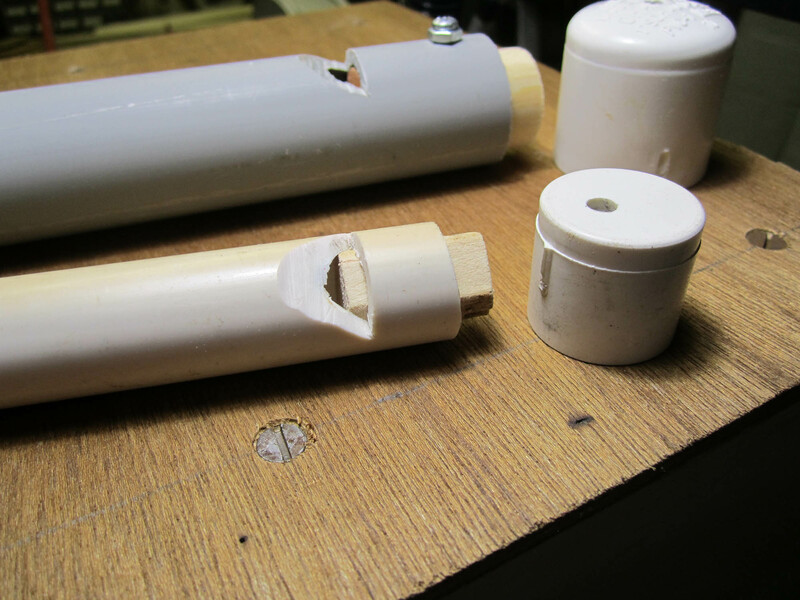 Step one: Cut holes in ½-inch plywood and figure out how to mount the axle in the holes with clearance on the outside for the gears and clearance on the inside for the impeller. The latter task required several trips to the hardware store. Step two: Take the rear wheel apart and mount it in the blower frame. 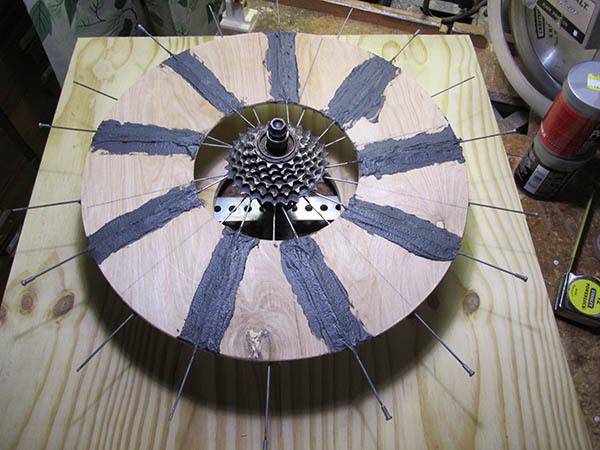 Epoxy the spokes onto the wooden impeller. 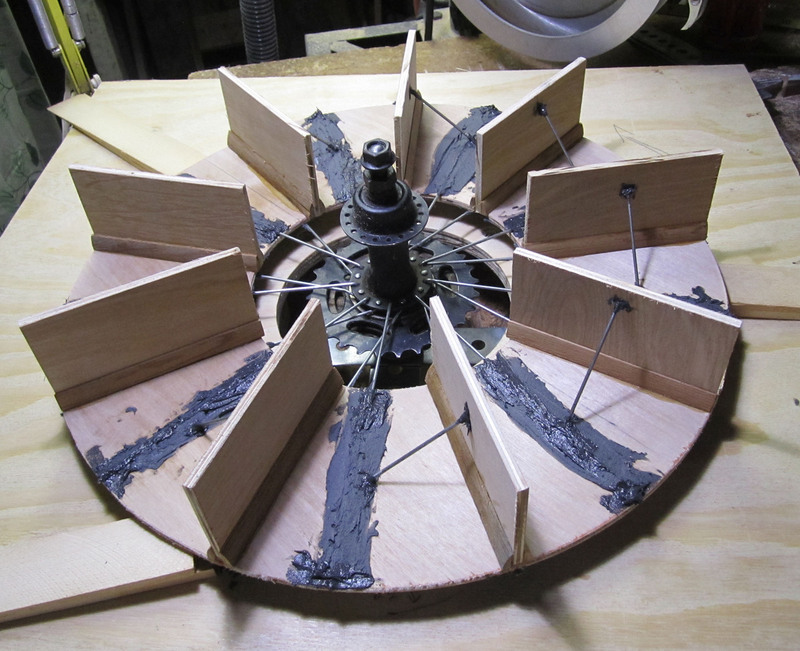 Step three: Glue on the wooden impeller blades. Having no idea how much wind force the blades would experience — not to mention accidental whacks during construction — I glued the leftover spokes as diagonal bracing. Step four: Enclose the impeller within a volute — an outer duct with a snail-shell curve. 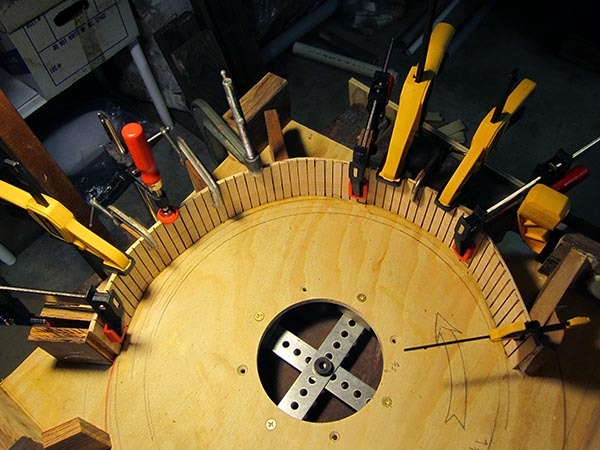 The simplest way to make it is to saw a bunch of kerfs in a strip of plywood, allowing it to bend smoothly. This part of the work has gone slowly, because the glue takes 12 hours to harden and I have a finite supply of clamps. What I'd really like is an epoxy that stays pliable until I wave a magic wand and then cures instantly. Dentists have a glue that is almost like that; it cures when exposed to ultraviolet light for 30 seconds or so. Might be something to look into. The completed volute and impeller. Absolutely nothing has been mathematically optimized here; it's all guesswork. 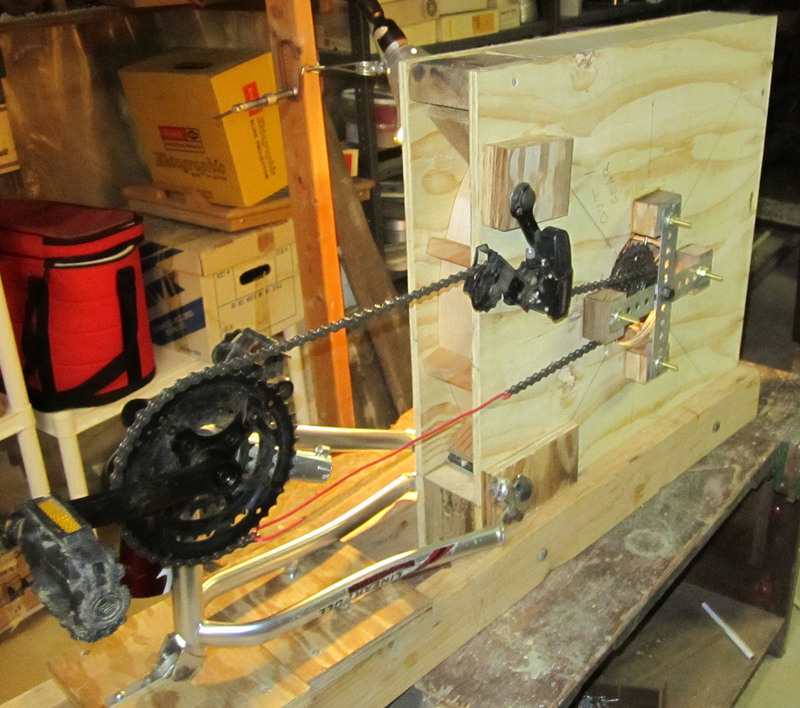 I have added a sturdy frame to hold the pedals and a tensioner pulley (the derailleur) for the bike chain. The chain is a bit short, but as soon as I splice in some more links, it will be ready for testing to see whether it can push enough air. And the result of the first test: total failure. Cranking the pedals as fast as possible, there's just not enough pressure to sound any pipes. Curses! And back to the drawing board. At the moment, I've no idea what change might improve things. It's time to do some reading and thinking.